If it wasn't for the fact that I really enjoy using my Amstrad I would've regretted buying it with all these homebrew releases for the C64 and ZX spectrum. 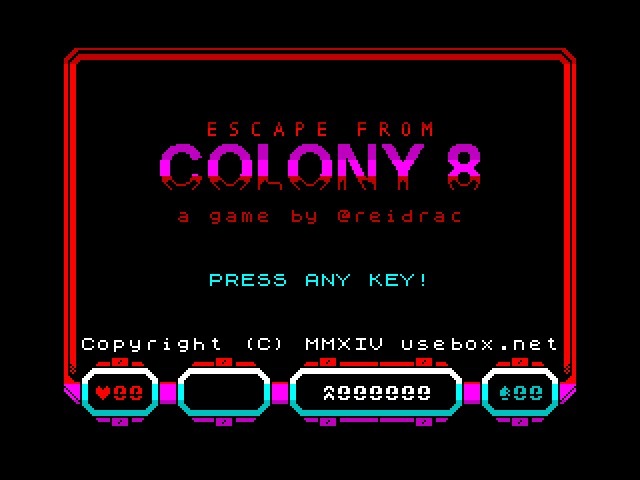 So here we are with another ZX Spectrum release, it's Escape from Colony 8, an action escapism developed by reidrac. The same developer behind that other fun game The Legend of Traxtor. The story is that you need to escape Colony 8 after a recent attack of your base, with no idea where they came from and the loss of the colony you need to get to the hanger and escape from the nightmare. Although not the highest graphical homebrew release we've seen, it's still a fun game as you traverse maze like corridors attacking enemies. Default keys are o, p, q, a and space. Hold fire for some seconds to load a missile (requires ammo), release fire to launch it. Use backspace to exit the game and 'h' to pause.